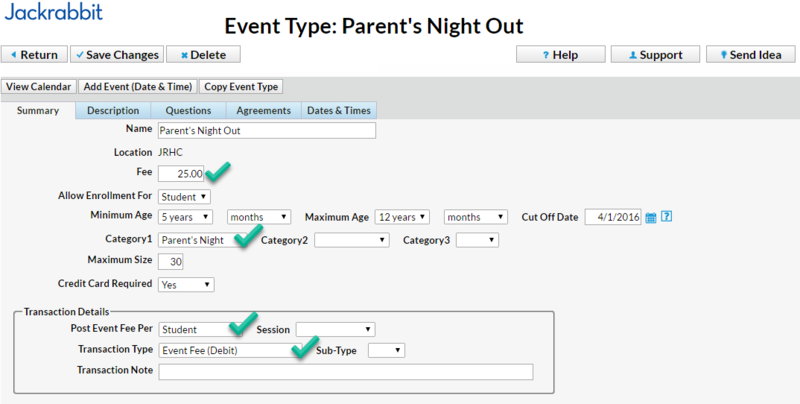 Selecting to auto-post an event fee by family will post one fee to each family. Point to the Events menu, create the Event Type or locate an already-created Event Type. On the Event Summary tab, enter an Event Fee. Ensure that the Category 1 is correct. Set Post Event Fee Per to Family. Add a Transaction Type and any other applicable details. Selecting to auto-post an event fee by student will post one fee to each student. Point to Events in the main menu; create the Event Type or locate an already-created Event Type. Set Post Event Fee Per to Student.